Zeytinyağlı taze fasulye (fresh green beans in olive oil) was one of the first Turkish dishes I ever attempted – for the basic fact that we had bought a Turkish cookery book whilst on holiday in Fethiye, gone back to England, and, when I leafed through the book’s pages, this Turkish green beans in olive oil recipe looked about the easiest dish I could attempt without complete disaster awaiting (of course, we’ve got lots more Turkish recipes in our repertoire, these days). If it all went horribly wrong, green beans are not the most expensive food in the world, so it didn’t matter too much…and, after all, what can possibly go wrong when you are cooking green beans, eh? 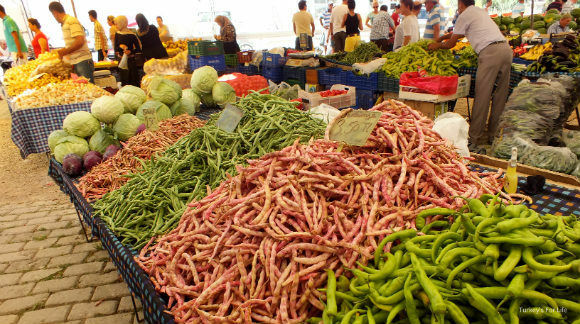 Living in Wigan and not having any fruit and vegetable market to speak of, it was straight to the supermarket to buy a bag of prepared, frozen green beans, but, fortunately, we’re blessed in Fethiye to have local markets with a whole variety of fresh and dried beans to choose from. Anyway, as our Turkish green beans in olive oil recipe is on the blog, you’ll know that all went well during that first attempt, and, since then, we’ve made tweaks here and there and it’s a regular addition to our meze table now we’re here, in Fethiye. It’s healthy, refreshing and green beans go with almost any other food – why wouldn’t it be a regular? Zeytinyağlı dishes (dishes containing lots of olive oil) are very common in Turkish cuisine where different, often seasonal, vegetables are cooked in olive oil and served at room temperature with freshly squeezed lemon. 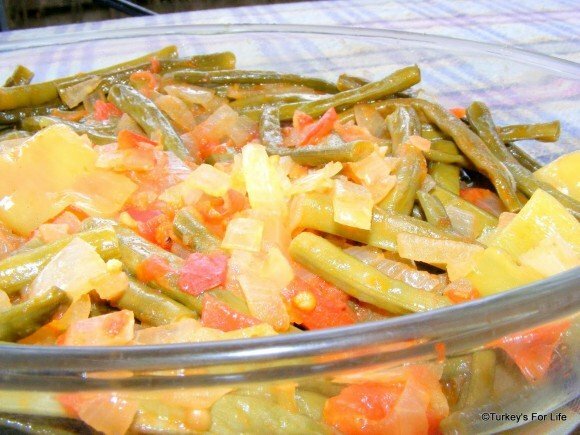 We’ve got other recipes on the blog that are cooked in this way such as our barbunya pilaki recipe and also our recipe for okra cooked in olive oil. Whenever we go to eat at a restaurant, we always order at least one zeytinyağlı dish in our meze choices because they’re so light and tasty, too. When we make our own green beans in olive oil recipe, though, we tend not to use so much oil. Because this dish has tomato in it, too, when we make it, we use a bit less oil and let the tomato add a bit more to the flavours. So, let’s make green beans in olive oil. Fresh green beans cooked in olive oil and served at room temperature with a zingy twist of fresh lemon are a perfect meze or accompaniment to grilled foods. Add the olive oil to a large saucepan and gently heat. Now add your onion and capsicum pepper. Sauté for around 5 minutes until the onion and pepper start to soften. Now add your green beans, salt and pepper. Stir around until the beans are coated in oil and they are mixed with the pepper and onions. Now add your chopped tomato, sugar and sliced garlic and stir those in, too. Boil some water and add just enough hot water to cover your beans. Bring it all to the boil and then reduce to a simmer and cover. Simmer for 25-30 minutes until your beans have gone soft. For each serving, squeeze a wedge of fresh lemon juice over the top before eating. The recipe says to trim your green beans. If you are using frozen green beans, they will already be prepared. For fresh green beans, most of the thinner ones don't have the tough fibrous 'string' that runs down the sides. 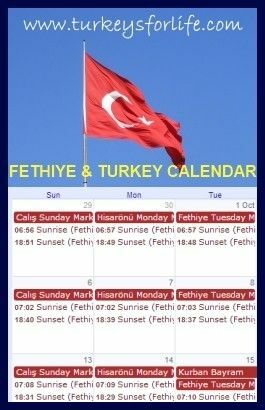 However, the more 'meaty' heirloom green beans will have this - many of the green beans on the local markets in Fethiye are of this variety, for example. To prepare them, cut the ends off and simply pull the 'string' away from the seam. And that’s it, really. Zeytinyağlı dishes are so simple to make but the reward in the eating afterwards far outdoes your efforts. For us, green beans were never really a big part of our regular menu but this recipe changed all that. 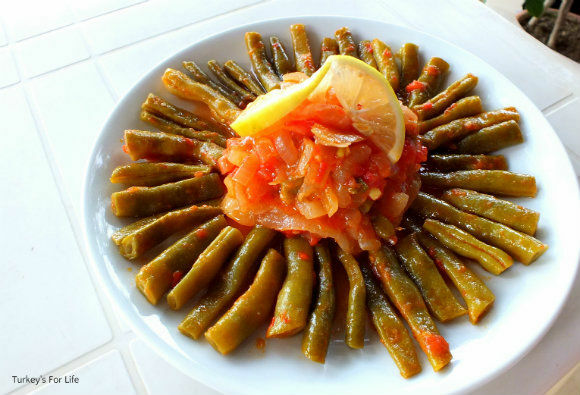 Meal Info: Turkish green beans in olive oil is suitable for both vegetarians and vegans. But let’s say you’re entertaining and you’ve got a few people coming round to your place to eat. Well, this is where you can make a simple, staple dish of Turkish green beans in olive oil look a little bit more swanky. It should impress your friends and, as far as we’re concerned, it makes potentially boring-looking green beans look much more appetising. We know how tasty green beans in olive oil is – and we just like to make sure our friends appreciate our attempts at Turkish cuisine, too. 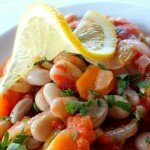 When you serve your beans, don’t forget to squeeze a generous amount of freshly squeezed lemon juice all over them. 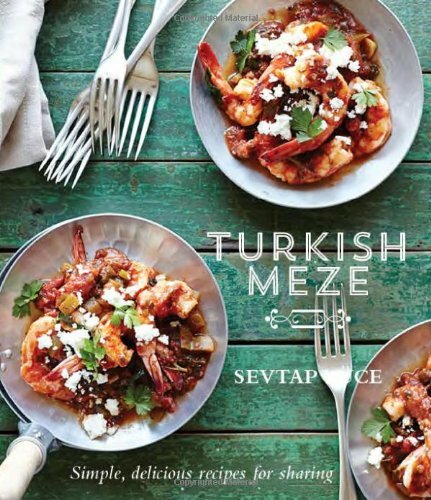 We eat zeytinyağlı taze fasulye as a meze – served alongside a selection of our other meze creations – or we use them as an accompaniment to grilled chicken, meat or fish. See, green beans in olive oil is not only tasty; it’s also versatile, too.